When the Board receives a complaint, the Board’s staff makes a preliminary inquiry. During this stage, you and other witnesses may be interviewed, and documents other than those provided with your complaint may be reviewed. Once there is sufficient information to conclude the preliminary inquiry, the full Board will review the complaint. If the Board believes that there is “clear and convincing evidence” of judicial misconduct, it may file formal charges against the accused judge with the Court of Judicial Discipline. The Board investigates the complaint. If warranted, it files charges against the accused judge in the Court of Judicial Discipline. The Court hears formal charges brought against a judge by the Board, and decides whether or not to impose discipline. 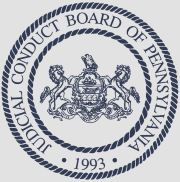 The judge subjected to discipline may appeal to the Pennsylvania Supreme Court, or if he/she is a Supreme Court Justice, to a Special Tribunal.